This post is way too over due. I was slacking. :( Anyway, This was back in December on my birthday. 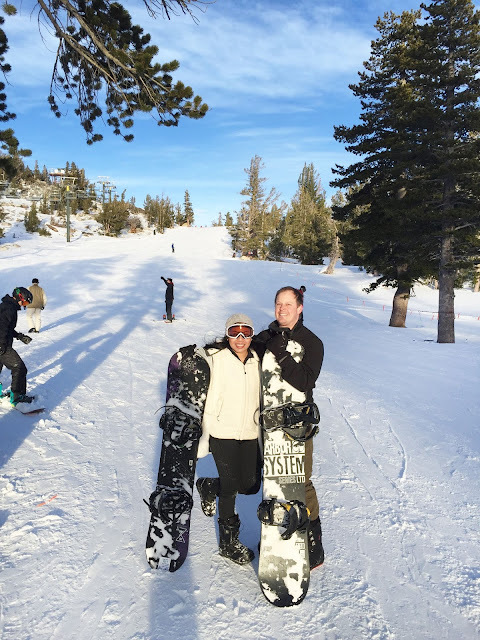 We headed up to South Lake Tahoe to stay for the weekend. We stayed at a chalet very close to the Heavenly Ski Resort. I couldn't believe I saw snow. It wasn't the greatest snow since it was very early in the season. But I couldn't care less. It was beautiful. I wanted to try snowboarding and so I did. I almost gave up. It was difficult. I didn't enjoy my first run at all. But I gave it another try and another. I am obsessed now. I can't even remember how many times I've been back at the mountain. I couldn't get enough of it. At this point Matt and I are regretting not getting season tickets. But were definitely getting them next year! Heavenly Ski Resort is beautiful. Especially the side where the Gondola is. They have a cute little town where people could hang out after or before heading up. It's also great for people who's not planning to go skiing or snowboarding. They have a few place where you can rent some gear. But go as early as you can. You'll get the "not so good" ones left if you go later. It is pretty pricey compared to other place. Since they are closer to the Gondola. I've definitely enjoyed my first time in the snow and enjoyed my first time snowboarding at Heavenly Ski Resort.